Instituted as a public education campaign by the American Public Works Association (APWA) in 1960, NPWW calls attention to the importance of public works in community life. The Week seeks to enhance the prestige of the often-unsung heroes of our society-the professionals who serve the public good every day with quiet dedication. 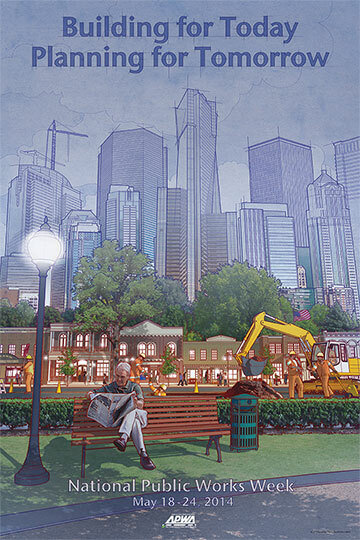 This years theme "Building for Today, Planning for Tomorrow" represents the classic idea of stewardship embodied by the profession of public works and the professionals that practice it. Focusing on the communities; "building" points out the day to day aspect of public works that is quality of life, while "planning" references the sustainable practices that ensure that quality of life for future generations. OTTAWA, ON. – The Canadian Public Works Association (CPWA), an organization of over 2,000 public works professionals in Canada with active chapters in each province, will join municipalities and provinces throughout Canada in celebrating National Public Works Week, May 18-24, 2014, to honor public works professionals. Celebrated since its inception in 1960, the week draws attention to the important contributions of public works professionals to citizens’ daily lives, including the planning, building, managing, and operating the heart of our local communities – its infrastructure. “Public works professionals are often unsung heroes of society, and this week honors those who serve the public good everyday with dedication,” said CPWA President, Darwin Durnie. As part of the celebration, CPWA annually recognizes the thousands of men and women in public works during the week of National Public Works Week (NPWW), to bring attention to those who provide and maintain the infrastructure and services. This year’s NPWW theme is: “Building for Today, Planning for Tomorrow,” and will be included in local and regional events and activities. The local celebrations will include observances of many kinds, including public open houses, displays of public works equipment, tours of public works projects, programs for civic organizations, and media events, as well as a focus on educating about a career in public works. Municipal public works departments often hold career forums in local high schools, and set up displays and demonstrations for elementary schools, as part of the NPWW celebration in many communities. NPWW celebrations, events and activities are also marked by resolutions and proclamations from other government leaders. As an integral part of CPWA’s National Public Works Week (NPWW), the provincial government proclamations help raise local awareness of the vitally important contributions of public works professionals and the crucial role that infrastructure, facilities and services play in the quality of life in our communities. This year, the proclamations enacted by provincial government leaders include: British Columbia, Saskatchewan, Manitoba, Alberta, Prince Edward Island, and Nova Scotia. Regina, SK, May 16, 2014 – The Government of Saskatchewan announced today the celebration of Public Works Week from May 18 to 24, 2014. The declaration of Public Works Week provides the opportunity to educate the public about the importance of public infrastructure and services. This year’s theme, “Building for Today, Planning for Tomorrow,” demonstrates the importance of planning for future growth and ensuring the province’s infrastructure is well supported into the future. Public Works Week is spearheaded by the Saskatchewan chapter of the Canadian Public Works Association. The chapter is made up of public works officials as well as companies and suppliers that support public works services. The Saskatchewan Chapter of the Canadian Public Works Association actively promotes professional excellence and public awareness through educational workshops, its annual conference and the involvement of the many public works officials, workers and agencies throughout Saskatchewan. This year marks the 54th celebration of Public Works Week. The week has become an annual event, celebrated during the third full week of May each year, and serves as an opportunity to acknowledge the efforts of public works professionals and their contributions to the province.